We are so excited to announce that Beemans Gum, Black Jack Gum and Clove Gum will be available again, however this is just for a limited time. Adams brings these old time nostalgic gums out once every 3- 5 years. Good news you will be able to buy your favorite gum again soon, as it will be available in July. Black Jack Gum is our top seller and the oldest of these 3 nostalgic gums. A black stick of gum with a smooth licorice flavor. Did you know that Black Jack is the oldest gum and the first stick gum to be wrapped? When it first came out in 1871 it had no flavor. The licorice flavor was added in 1884. It was also used to sooth a sore throat. This is the best tasting licorice gum around it is a shame it is only available for such a short time. Beemans gum was the next to follow Black Jack, coming out in the late 1890’s. It was invented by Dr. Edward E Beeman. He came up with the idea of taking chicle gum and adding pepsin powder. Not only did this pepsin-flavored gum taste good, but it was also used as an aid in relieving heartburn. Clove gum is another vintage gum that came out in the early 1900’s. This gum is made with the clove spice giving it a very distinctive flavor. The clove spice gives this chewing gum a sweet yet spicy flavor all in one. Clove gum became very popular during prohibition. It was used to cover up the smell of tobacco and alcohol on your breath. It became known as a breath fresher gum. 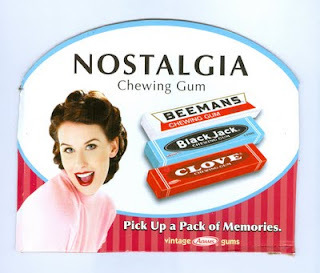 Although now a days we purchase these old time gums to reminisce of days gone by and relive our childhoods. Back in the 1900’s these gums were used not only as a treat but also as medicinal purposes. • Clove Gum was used as a breath freshener. Although these are the top 3 flavors of nostalgic gums made by Adams, which is now owned by the Cadbury Company. Many of you may also remember Adams sour apple, sour cherry and sour orange gum. Unfortunately they no longer make these flavors. About 5 years ago they came out with the apple and cherry, but I haven’t seen the orange in years. Unsure as to the reason why this gum is only available every couple years we do know that once it hits the market, it is sure to sell out fast. One good thing is the shelf life on this gum is approximately one year from the date of production. If you just have to have the gum you ate as a kid let us know and we can email you when it arrives, as it is sure to sell out quickly. Each box has 20 packs of gum with 5 sticks each. If you would rather not have a whole box, we also sell it by the pack. If you would like to be notified when these gums become available let us know and we can send you an email.